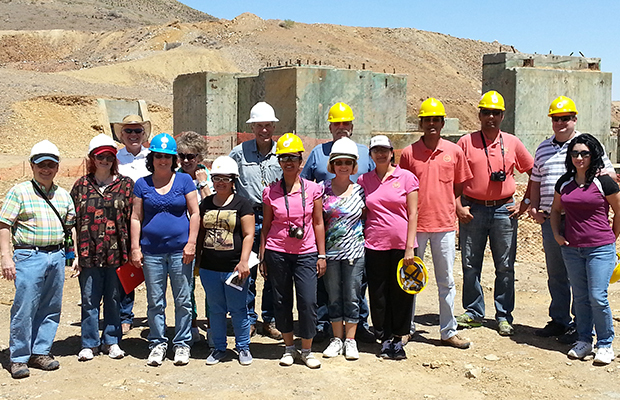 ​During the summer months, we hosted a series of tours, and we want to express our gratitude that so many people in the community took time out of their day to visit us at the Copper Flat Mine. Our hope in inviting communities to visit the Copper Flat Mine Project was to get more people in Sierra County acquainted with the site. We were thrilled to have so many of you from the community attend; we enjoyed show- ing you around the site, answering your questions, and discussing the topics of interest and concern over several beautiful days. Understandably, the main concern of many visitors was water supply and water quantity. at Copper Flat, ranging from administrative to labor to engineering. We will also require the contractor we choose for mine construction to make every effort to recruit locally for appropriate positions. We are committed to continue providing updates and news to Sierra County, along with opportunities to get involved, as we continue the permitting process and pre- pare for construction. Please kee an eye out in the newspapers, as we continue to host Copper Flat site tours in the future.